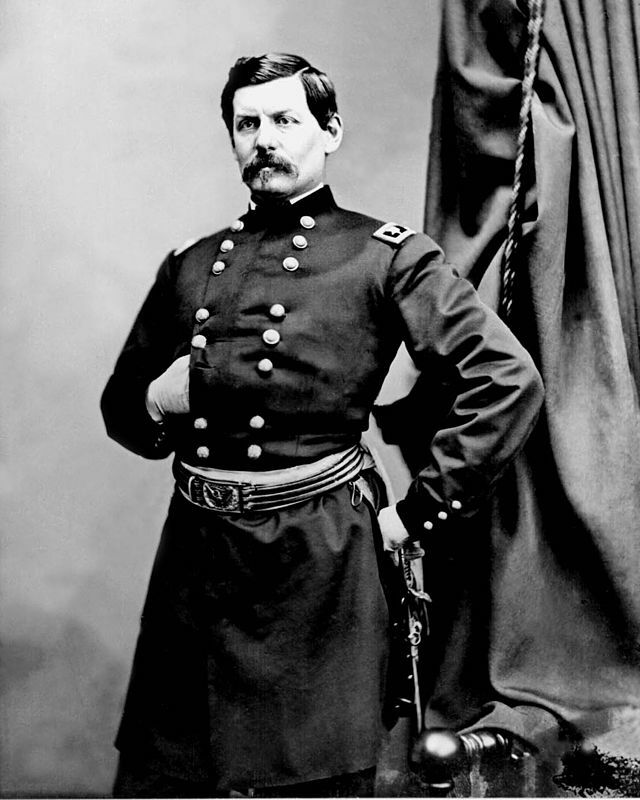 George McClellan was born in Philadelphia, Pennsylvania, on 3 December 1826. He attended college preparatory schools, and briefly attended the University of Pennsylvania before he accepted an appointment to the United States Military Academy. In the Mexican War he served as an engineer for Generals Zachary Taylor and Winfield Scott. After the war, he taught at West Point until 1851. McClellan was promoted to captain in 1855 and assigned to the new 1st Cavalry Regiment. He was an observer of the Crimean War in 1855-56. Having designed a new saddle for the Army (which became known as the McClellan Saddle), he resigned his commission in 1857 to become the chief engineer and later the vice president of the Illinois Central Railroad. In 1860, McClellan married Mary Ellen Marcy. When the Civil War broke out, McClellan was made a major general of Ohio Volunteers. Soon, he was made a major general in the Regular Army, and soundly defeated the Confederates in western Virginia. Abraham Lincoln appointed him to head the Army of the Potomac in late 1861. McClellan served as the commanding general of the Army from 1 November 1861 to 11 March 1862. Lincoln removed him as commanding general to lead the Army of the Potomac in the field. McClellan led the Union in the Peninsular Campaign, and fought at Yorktown, Fair Oaks, and the Seven Days’ Battles in 1862. Later, he fought at South Mountain and Antietam before Lincoln placed him on the inactive list. In 1864, McClellan left the military to run for president against his old commander-in-chief. After he lost, he traveled to Europe for three years. When he returned, he served as the chief engineer of New York’s Department of Docks before he was elected governor of New Jersey. He was governor from 1878 to 1881. McClellan died in Orange, New Jersey, on 29 October 1885.